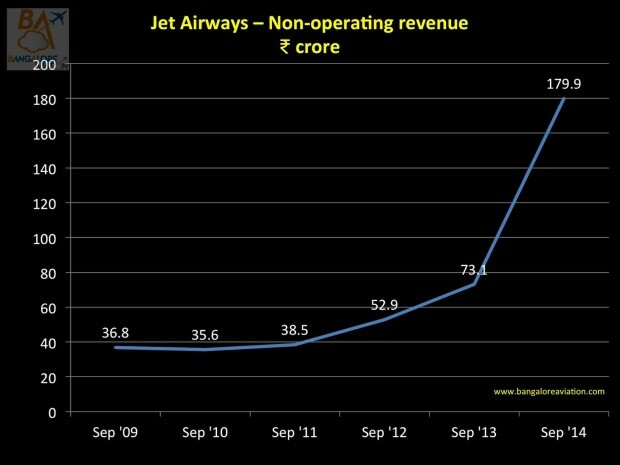 Jet Airways, India’s largest private airline recently announced results for the second quarter (Q2) and the half-year (1H) for fiscal 2014~2015. The results were the first after a joint announcement with 24% stake holder Etihad Airways PJSC about the airline ceasing operations of its low cost JetKonnect brand exiting the segment. The Jet Group operates two airline operator licenses. 9W for Jet Airways and S2 for JetLite, the erstwhile Air Sahara which Jet acquired. The airline reported profits of Rs 69 Cr (approximate $11.3 million at current conversion rates), a first in seven quarters. 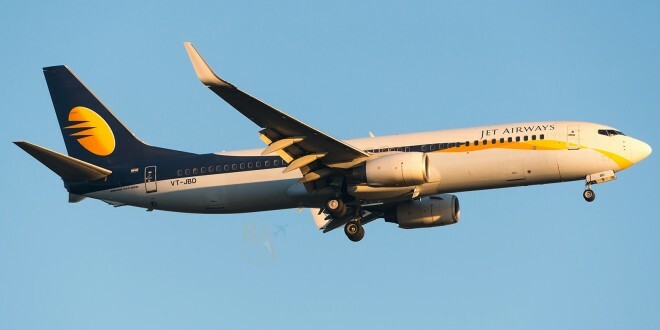 Operationally Jet remains in the red, reporting losses of Rs 266.39 Cr, an improvement of over 40% as compared to the same quarter last year, when the airline reported losses of Rs 655.93 Cr.. The profit reported is thanks to the Rs 305 Cr surplus generated from the sale of its frequent flier program (FFP) Jet Privilege (JP) to Etihad. Interestingly, while the cash for this sale was received much earlier, as acknowledged by the airline in a conference call with analysts, the airline accounted the income only in this quarter saying the formalities of spinning off JP and completing the transaction occurred in this quarter. The airline has shown an impressive 16.4% revenue growth year-on-year, partly driven by the contractions reported from Q2 FY13 to Q2 FY14. Average revenue per passenger has increased 13.6% to Rs 9,145 compared to the same period last year, but there is a drop from the Rs 9,158 the airline achieved in Q2 fiscal 2013. When one factors in inflation over the last two years, in real terms the airline earns about 20% less today per passenger. Continuous focus on costs and retiring expensive debt has led to 10.3% year on year reduction in cost per available seat kilometre (CASK) to Rs 3.90 from Rs. 4.34. Revenue per available seat kilometre (RASK) is up 6.7% to Rs 3.70 from Rs 3.46. The break-even load factor is now at a realistic 83.4%, down from 98.2% a year ago. The market share reduced to a combined 20.2%, the lowest in 2014. With 33.76 lakh domestic passengers, the airline was only marginally better than SpiceJet, which has much lower fleet capacity but fills its planes more thanks to its frequent sales. 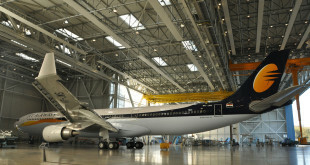 Jet has taken up many initiatives to meet its publicly stated goals of returning to profits by 2017; which include joining the Etihad Partners alliance, leasing much of its wide-body fleet to Etihad, re-deploying capacity from competition intensive domestic markets to international routes feeding the Abu Dhabi hub of Etihad, and working closely with Etihad and improving operational indices to get back business passengers. During the quarter Jet announced many new flights to Abu Dhabi from many Indian cities during the quarter. Many of them are already operational. The few left will be done before March 2015. The strategy of moving capacity from domestic to international is reflected by the four metrics. 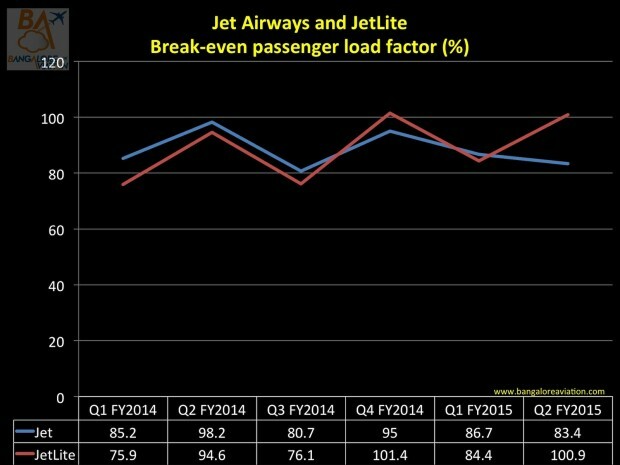 Concerns remain for Jetlite which continues to have break-even load factors above 100% and dismal average revenue per user. As the airline phases out low cost service and moves to a complete full service operation, the operations of Jetlite (S2 code) will either see drastic loss of loads if yields are increased or there will be reduction in yields for mainline due to the strain of S2. As the management answered in the conference call with analysts, the airline has made a decision to have customer touch points same, with full service, however how this will be handled will be informed later as the teams are still working towards it. 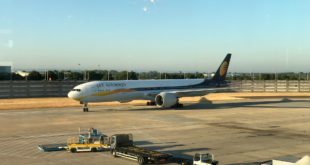 From having Jet Airways main-line, JetKonnect and Jetlite, to having Jet Airways and Jet Konnect and now having everything under Jet Airways has been a good progress to remove the brand confusion created. However, what still is missing is change in livery to have uniform branding, and while that is part of the plan, it will only be done later so as to avoid costs and down time of aircraft. The airline currently has an active fleet of 113 aircraft, 26 of these are owned and 87 are leased. Much of Jet Airways wide-body fleet is leased to other airlines. Three A330-200s are leased to Turkish Airlines, two A330-200 and four Boeing 777-300ER are leased to Etihad with a fifth joining very soon. While it may be financially sound to lease the excess aircraft, an airline is primarily in the business of transporting passengers and this excess capacity is an indictment of the lack of cohesion between fleet planning and route planning. 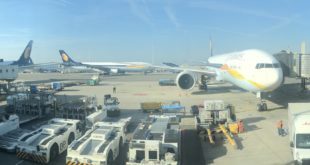 The lack of wide-body fleet utilisation also reflects the financial constraints Jet faces in devising and deploying a sound inter-continental route network. Most international routes take between 18 months to 36 months to break-even. Money that Jet just does not have. The airline, even today, parks two wide-body aircraft at Hong Kong for the whole day (morning arrival and evening departure) effectively grounding the equivalent of one aircraft permanently because it is unable to find lucrative destinations beyond. The airline is in the process of reconfiguring all its Boeing 737-800 fleet, to a standard configuration of 12 business and 156 economy class seats. The much needed standardisation will help it rotate aircraft efficiently across domestic and international sectors and not maintain a separate sub-fleet with its high costs. The reconfiguration of the last 12 aircraft is expected to be completed by January 2015. A lot of frequencies are being commenced on existing and new routes during the third and fourth quarters. Jet has launched Ho Chi Minh City, Vietnam, a new destination. The new frequencies will naturally put some strain on the Jet’s balance sheet, but passenger inflows from Etihad should lessen the pain. 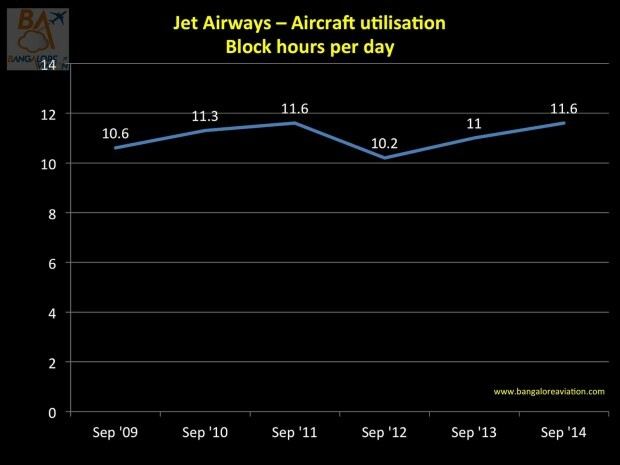 Jet is smart in exiting the low cost segment. It would have been caught between two global behemoths. AirAsia India on the low side and the Tata-SIA promoted Vistara on the full service side. Still the airline will face pressure from the fourth quarter onwards once Vistara launches. There will be a sure and steady shift of passengers to the new airline. Air India’s deployment of wide-bodies, especially the popular 787 Dreamliner on key metro routes will put pressure on yields. Non-operating revenue has zoomed 146%. Will this trend continue? The sale of the JP frequent flier program will provide an infusion of Rs 1,123 Cr. at a rate of around Rs 300 Cr per quarter to buttress the bottom line, but this is illusory being the equivalent of selling the family silver to meet current expenses. Similarly, is the 146% increase of non-operational revenue from Rs 73.1 Cr to Rs 179.9 Cr a one time affair? Or will the airline continue to earn such high numbers? The company has not provided any clarity on this. Improved aircraft utilisation including those wide bodies parked in Hong Kong to gel well with the bank at Mumbai and have better commercial timings, will come only in next summer, whose results will start reflecting only in fiscal 2016. The narrow body fleet utilization has gone up by reducing the time aircraft spent on ground at Bangkok and Singapore due to introduction of additional flights. Ameya Joshi is a solutions consultant working across the transportation spectrum. He has past work experience in aviation, public transport, express courier and railways. Follow him on Twitter and visit his blog.